Cataract affects nearly 9–12 million Indians annually after the age of 50 years. And, this exceeds glaucoma, macular degeneration, and diabetic retinopathy numbers combined. Cataract surgery is the most frequently performed surgery in India, with a success rate of nearly 98% and excellent visual rehabilitation. More than a million intraocular lenses (IOL) are implanted every year. Cataract surgery has achieved a degree of precision where it has become a keratorefractive procedure and an expectation of complete visual rehabilitation in terms of visual acuity for distance and near, contrast sensitivity and depth of focus. The most common reason for poor visual result in spite of an impeccable surgery is miscalculation of IOL power which makes it the most crucial component of the presurgical workup. The quest to determine an IOL formula that can achieve postsurgical emmetropia and can apply to all types of eyes/situations has been a continuous one. Formulae for calculation of IOL power have evolved since Harold Ridley implanted the first IOL in 1949 and was surprised to get a postoperative refraction of −18DS/+6DC/20°. He implanted an IOL of power 23D since that was the power of the natural lens. Since then the ophthalmologists have strived to arrive at a reliable IOL formula. The evolution of IOL formulae can be classified on the basis of their derivation as (a) theoretical formulae, (b) formulae based on regression analysis, and (c) a combination of both principles. Various phases of IOL power Formulae evolution have been labeled as various generations. Initially, a power estimation method was used, and the patient's preoperative refraction was taken into account. Later, this evolved into a more specific calculation based on biometric parameters. First-generation formulae, such as SRK (Sanders, Retzlaff and kraff) was based on the regression to estimate power of the lens which was based on cornea (K) and the Axial length (AL), Along with A- Constant of the specific IOL, to estimate power for IOL. They were found to be accurate in average sized eyes, but for shorter or longer eyes these formulae were not reliable. In second generation formulae, a modification was made in SRK-II. The third generation entailed moving from regression-based formulae to theoretical formulae that helped increase accuracy further by using biometric data to estimate the postoperative effective lens position (ELP) within the eye. The commonly used third-generation formulae were Holladay 1, the SRK-T, and the Hoffer Q. Each of these formulae estimates ELP based on K reading and/or axial length (AL) and the results have been more accurate. These third-generation formulae have proven to be very popular because they balance good results with simplicity and utilize only two biometric data points, i.e., keratometry (K) and AL. Latest fourth-generation formulae use additional biometric parameters and critically depend on ELP. There is a universal application of ELP in all fourth-generation formulae, but this is indeed the only parameter that cannot be measured accurately preoperatively. ELP is defined as the effective distance between the anterior surface of the cornea and the lens plane if the lens was infinitely thin. ELP is the main limiting factor for refractive predictability after cataract surgery, as the accuracy of AL and K reading has now been established. 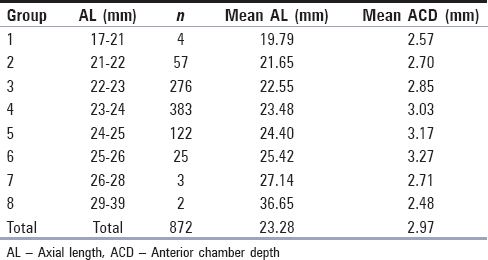 In spite of all these refinement refractive surprises still occur, and therefore, we revisited predictability of ELP based on AL and anterior chamber depth (ACD). We studied 872 age-gender-refraction matched eyes and determined the correlation between AL and ACD. The intuitive view is that with increasing average AL average ACD should also increase proportionately. We also observed the same trend. 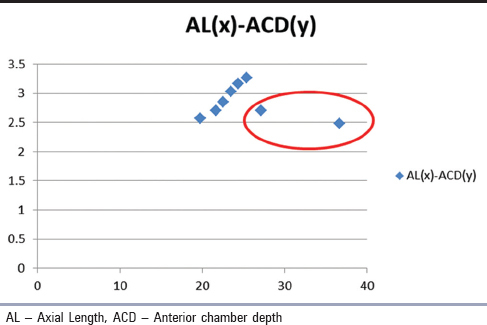 However, a differential analysis of AL and ACD in the eyes of near-equal AL revealed marked variation in ACD. This prompted us to evaluate if there was indeed a correlation between AL and ACD. This study measured the degree of correlation between overall AL and ACD in eyes undergoing Cataract surgery and further studied correlation between AL and ACD in eyes with equal AL. ACD must be considered while calculating ELP and therefore, has a direct bearing on theoretical formulae that incorporate ELP. The likelihood of varying ELP in spite of equal AL makes fourth-generation formulae inherently unpredictable and may result in deviation from PSE causing postoperative surprises. In a prospective observational study from June 2017 to May 2018, K and optical biometry records of 872 patients who reported for cataract surgery were taken. The study protocol was approved by the Ethics Committee. Nucleus grading: NS II (LOCS). Patients with a history of ocular trauma/surgery, glaucoma, corneal opacities/dystrophies, diabetic retinopathy, hypertensive retinopathy, and macular pathology were excluded from the study. An analysis of 872 Eyes was done using optical biometry (Zeiss IOL master) wherein the preoperative measurement of AL in mm up to 2 decimal places, ACD in mm and IOL power calculation by SRK-T formula was done. Data were analyzed using Kendall-Pearson's coefficient. First, a correlation between overall AL and ACD in all eyes taken together was calculated. Thereafter, eyes were divided into groups on the basis of AL, i.e., <21 mm, 21–22 mm, 22–23 mm, 23–24 mm, 24–25 mm, 25–26 mm, 26–28 mm, and >28 mm and their ACD was measured. The range of ACD within the eyes of a particular AL and the correlation between the two parameters was calculated. Data were analyzed by SPSS version 18 (233 South wacker drive, 11 floor, Chicago, IL, USA). Patients were classified into various groups for a differential comparison. Descriptive data are presented as frequency and percentage, where appropriate. Qualitative data were compared among groups using the test. The independent-samples t-test was used, to compare quantitative data between two groups. The Kendall and Pearson product-moment correlation tests were used, to assess the relationship between AL and ACD. The linear regression model was used, to obtain a mathematical model to estimate ACD. P < 0.05 was considered as statistically significant. A total of 872 eyes were studied together and then allocated to eight groups based on AL. Overall, for 872 patients together mean AL was 23.28 mm (range 17.04–38.29 mm, standard deviation [SD] =1.13), mean ACD was 2.98 mm (range 1.78–4.25 mm, SD = 0.42) [Table 1] and there was a weak positive correlation of 0.13 which was statistically significant (P < 0.000) [Table 2]. As the overall mean AL increased, overall mean ACD also increased till AL of 26 mm as is seen in a clear trend line [Table 3]. The two outliers (Group 7 and 8; 26–28 mm and >28 mm) can be seen in the circle. Since the number of patients in Group 7 and 8 were very small, they were not included in statistical analysis. Group 1 had eyes with AL 17–21 mm were considered (n = 4). Mean AL was 19.78 mm (range 17.04–20.93 mm, SD = 1.84) and mean ACD was 2.57 mm (range 2.18–2.96 mm, SD = 0.32) having a positive correlation of 0.86 and P = 0.141 [Table 1], [Table 2], and [Table 4]. Group 2 had eyes with AL 21–22 mm (n = 57) with mean AL of 21.65 mm (SD = 0.23) and mean ACD was 2.70 mm (range 2.01–3.33 mm, SD = 0.40) with a negative correlation of − 0.14 with P = 0.291 [Table 1], [Table 2], and [Table 4]. Group 3 had eyes with AL 22–23 mm (n = 276) with mean AL of 22.55 mm (SD = 0.27), mean ACD of 2.70 mm (range 1.91–3.77 mm, SD = 0.39) with positive correlation of 0.09 and P = 0.125 [Table 1], [Table 2], and [Table 4]. Group 4 had eyes with AL 23–24 mm (n = 383) with mean AL of 23.48 mm (SD = 0.29), mean ACD of 3.03 mm (range 1.78–4.25 mm, SD = 0.40) with positive correlation of 0.14 and P = 0.007 [Table 1], [Table 2], and [Table 4]. Group 5 had eyes with AL 24–25 mm (n = 122) with mean AL 24.97 mm (SD = 0.27), mean ACD of 3.17 mm (range 1.78–3.93 mm, SD = 0.41) with positive correlation of 0.11 and P = 0.245 [Table 1], [Table 2], and [Table 4]. Group 6 had eyes with AL 25–26 mm (n = 25) with mean AL 24.42 mm (SD = 0.28), mean ACD of 3.27 mm (range 2.34–3.88 mm, SD = 0.43) with a positive correlation of 0.11 and P = 0.245 [Table 1], [Table 2], and [Table 4]. Group 7 had eyes with AL 26–28 mm (n = 3) with mean AL 27.14 mm (SD = 0.75), mean ACD of 2.71 mm (range 2.12–3.76 mm, SD = 0.91) with a negative correlation of − 0.15 and P = 0.904 [Table 1], [Table 2], and [Table 4]. Last group had eyes with AL >28 mm (n = 2) with mean AL 26.64 mm (range 35.00–38.29 mm, SD = 2.33), mean ACD of 2.48 mm (range 2.42–2.54 mm, SD = 0.08) with a positive correlation of 1 and P = 0.000 [Table 1], [Table 2], and [Table 4]. It is seen that while the correlation between overall AL and ACD was significant, there was no significant correlation in other groups except Group 4 (AL 23–24 mm). Cataract surgery is a keratorefractive procedure where the patient expects total visual rehabilitation in the form of improved vision, contrast sensitivity, and depth perception. The most important cause of a refractive surprise after IOL implantation is an incorrect IOL power calculation which is the single most important determinant of patient satisfaction after surgery. It depends on multiple variables such as AL, K, ACD, and ELP. To achieve PSE, the IOL power calculation formulae have evolved since the time of Harold Ridley when an IOL implant of 23D resulted in a postoperative refraction of nearly −18DS/+6DC/20°. First-generation formulae such as the SRK considered the power of the cornea K, AL, and A constant of the specific IOL. This was based on a regression analysis of residual refractive power of eyes following surgery. It was found to be reasonable in average sized eyes (22–24 mm) but in smaller and larger eyes, lacked accuracy. Second-generation formulae (SRK-II) incorporated a modification to improve the formula by altering the A-constant based on AL and achieved better, but still unsatisfactory results. This led to a conceptual shift in that instead of regression-based calculation; theoretical formulae were employed that now used biometric data to estimate the postoperative ELP within the eye. The commonly used third-generation formulae were Holladay 1, SRK-T (T for theoretical), and Hoffer Q which helped increase accuracy further. Each of these formulae estimates the position of the IOL within the eye based on the K and/or AL, and the results are more accurate. Therefore, the use of older regression formulae has declined significantly in clinical practice. The quest for further accuracy led to the application of fourth generation formulae that use additional biometric parameters: Haigis formula requires ACD and ELP, Holladay 2 formula requires ACD, ELP as well as white-to-white distance, lens thickness, preoperative refraction, and patient's age. The evolution of IOL formulae has produced great accuracy but the goal of successfully reaching a given target refraction 100% of the time is still a difficult outcome to achieve as the ELP depends on different variables. The general principle behind every IOL formula is to calculate and predict the postoperative ELP. The first generation of IOL formulae considered the ELP to be a constant numeric value. Subsequent advanced theoretical and regression formulae began using more biometric data to calculate the ELP. The use of AL, corneal power, measured ACD, and white-to-white measurement further refined the accuracy of ELP prediction. All formulae for calculating IOL Power have a fundamental structure: A vergence calculation, a method determining the ACD and ELP (final resting position of the optic). ELP is the principal way that these formulae differ, with the vergence calculation being essentially identical across the board. The ACD relates directly to ELP and therefore has a critical role in the accuracy of IOL calculations. Holladay also found that eyes can have a shallow, normal, or deep anterior chamber in a short, average or long AL eyes. These variations can result in large differences in IOL calculations, and a small anterior chamber in a short eye one can expect the IOL power to be high. However, an equally short eye with deep anterior chamber will have a far larger IOL power and more uncertainty in IOL power calculation because the ELP will be farther from the cornea and closer to retina. The conventional view is that greater the ocular AL, greater should be the ACD. In our study also as the mean AL increased from 19.78 mm to 25.42 mm correspondingly the ACD also increased from 2.57 mm to 3.27 mm [Table 4]. We have not considered eye longer than 26 mm since the number was small (only 5). A Chinese study by Chang John in 2012 found that there was a statistically significant positive correlation between AL and ACD in normal and long eyes but not in extremely long eyes. We also observed this dissociation in the five eyes that were longer than 26 mm where in spite of an increasing AL (AL 27.14 mm: ACD 2.71 mm and AL 36.64 mm: ACD 2.48 mm) ACD actually decreased. We have not been able to find an answer to this observation in spite of an extensive literature search. Is it possible that in longer myopic eyes it is only the posterior retrolenticular section of the globe that differentially elongates while the anterior segment is normal-sized? 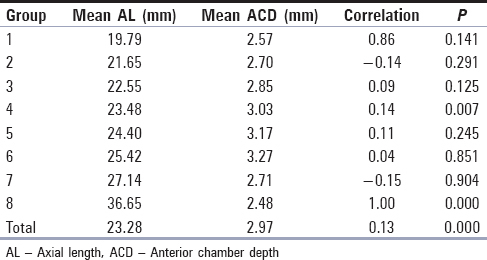 Another American study in 2008 by Jivrajka R found a positive correlation between AL and ACD and an inverse correlation between AL and Lens thickness. Although ACD should broadly with increasing AL we were surprised to see significant variation in the ACD in eyeballs of nearly the same size. This prompted us to do a differential group analysis, and we examined the ACD in the eyes of AL <21, 21–22, 22–23, 23–24, 24–25, 25–26, and >26 mm. There was a wide variation in ACD and eyes with AL 21–22 mm ACD ranged from 2.01 mm to 3.33 mm with IOL power (SRK-T) ranging from 19.5D to 27.5D. In eyes with AL 22–23 mm ACD ranged from 1.91 mm to 3.77 mm with IOL power ranging widely from 17D to 27.5D. Similarly, there was wide variation in ACD and consequently in the power of the IOL to be implanted in eyes with comparable AL [Table 4]. Within the group with similar AL, there was no correlation between AL and ACD. This signifies either a difference in lens thickness or a difference in position of the Lens. Since thickness of the Lens was likely to be comparable in these eyes (being gender and age matched), it was the Lens position that was found to be extremely variable. Variable lens position would result in inevitable variability of ELP, which would influence the IOL power calculation in various fourth-generation formulae that incorporate ELP. We carried out an extensive literature search but could not find any study that tried to determine AL-Specific correlation with ACD. The present study was undertaken to determine if there was indeed any linear correlation between AL and ACD. If AL and ACD are correlated only then can one assume that the position of the Lens is fixed and therefore ELP can be accurately calculated. If it was otherwise or the correlation was weak or nonlinear, then it is very difficult to determine postoperative ELP which is a critical determinant of IOL power in fourth-generation formulae. The central thickness of the Lens and its position would have to be considered in estimating ELP without which fourth-generation formulae would be inherently unpredictable. This study establishes that there is no linear positive correlation between ACD and AL. Although fourth-generation IOL Formulae are superior to all previous formulae since they still rely on ELP (a parameter that differs in the eyes of even same size), they are inherently prone to error. We observed that as overall mean AL increased overall mean ACD also increased but the differential correlation between different AL-based groups was very weak [Table 4] and in some instances was even negative (Group 2: AL - 21–22 mm). In all previous studies that we found in the literature, the correlation between AL and ACD was determined, but there was no analysis for eyes with similar AL. As a general trend, an increase in mean ocular AL is accompanied with an increase in ACD and we also observed the same trend. However, the further differential analysis shows that within the eyes with near-equal AL there is wide variability in ACD. This may be due to either varying central lenticular thickness or due to the position of Lens in the anterior segment. The position of the Lens has a direct bearing on the ELP following IOL implantation. Therefore, ELP based formulae (Haigis and Holladay 2) have an inherent element of unpredictability and may result in postoperative refractive surprises. This study was done at Command hospital Kolkata by Dr. Sumit Kumar Singh guided by Dr. Rakesh Maggon, and it was approved by the Ethical Committee. Survey of Blindness-India, NPCB-WHO Report. New Delhi: Ministry of Health & Family Welfare, Government of India; 2015-2018. World Health Organization. The World Health Report, Life in 21st Century – A Vision. Geneva: World Health Organization; 2018. Williams HP. Sir Herold Ridleys vision. Br J Ophthalmol 2002;120:1198-573. David J. Sir Herold Ridley & His Fight for Sight, He Changed the World so that we may Better. New Jersy; 2006. Available from: http://www.DR. Hills.com/iol/haigis. [Last accessed on 2018 Aug 15]. Gavin EA, Hammond CJ. Intraocular lens power calculation in short eyes. Eye 2008;22:935-8. Devgun U. Ocular surgery US Edition. 2016;3;1327:72. Holladay J. Clinical results using the intraocular lens power formula. Cataract Refract Surg 1997;9:1356-70. Chang John SM. Department of ophthalmology Hong Kong Sanatorium hospital. Asia Pac J Ophthalmol 2012;1:215-3. Jivrajka R, Shammas MC. Study. J Cataract Refract Surg 2008;34:1535-9.